I’m still reeling from my recent pumpkin discovery, and I just discovered the easiest way to deal with a whole pumpkin: roast it whole. The instructions are simple: turn the oven on to about 200 C / 390 F. Poke a few holes in the top of the pumpkin so it doesn’t burst (not sure if this is necessary but why risk it?). Put the pumkin in the oven. Put a baking tray at the bottom of the oven to catch any juices that might ooze from the pumpkin. 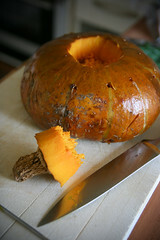 Cook until a knife inserts into the pumpkin easily, about 45 minutes. When it’s done, all you do is slice it up and remove the seeds which, btw, are super easy to get out once the pumpkin is cooked. I used my pumpkin in some rockin’ black bean and pumpkin enchiladas with quick mole sauce. Tim went the simple route and had a wedge of pumpkin with some of the mole poured on top. Knee consultation: Got my MRI results back of the knee. No tendonitis. One small cyst but nothing serious. The usual prognosis: get stronger. Lunch: Cottage cheese and tomato on toast with chives and mint. Plus tons of raw veggies on the side. 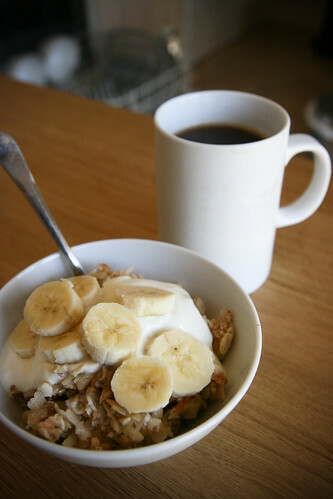 Bircher muesli with yogurt and banana. 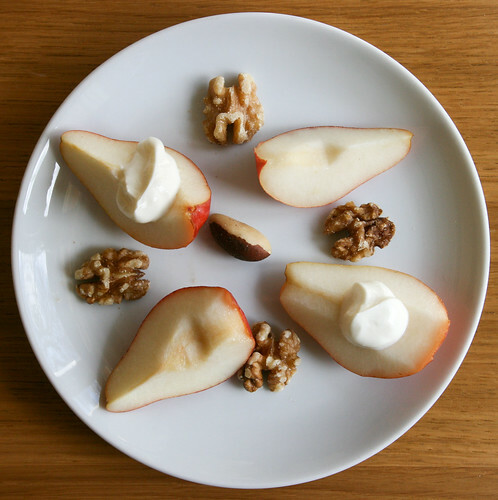 Note to self: Dorset muesli is much better on its own with yogurt than soaked for Bircher. I will return to my usual Bircher muesli recipe next time. 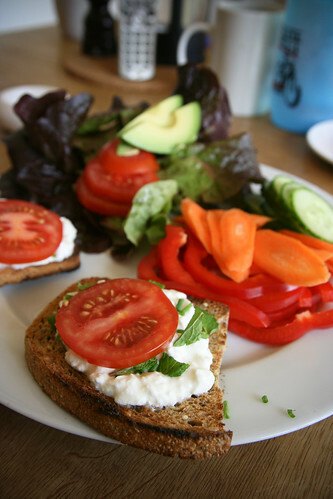 Cottage cheese and tomato on toast with chives and mint. Plus tons of raw veggies on the side. Using the mole with the pumpkin and black bean burritos is a great idea! Mole would go so well with pumpkin! BTW, someone emailed me asking for the recipe for the mole enchiladas, so I’m copying my response there. I only made two enchiladas but you could easily scale this up for more. The directions are long but the process is pretty simple. You could make it simpler by omitting the spices, mushroom and pepper, but I do think they add to the dish. 1. Preheat the oven to 350 and lightly oil a baking dish. 2. Heat up the olive oil in the pan on medium and add the cumin and mustard seed. When the mustard seeds start to pop, add the onion and pepper. Saute until the onion is soft, then add the mushroom. Cook until the mushroom is done, then season with a little salt. 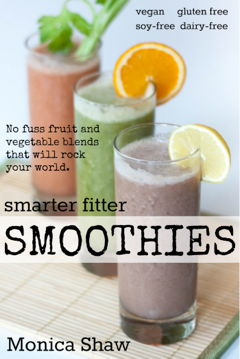 Set these veggies aside. 3. Heat up the mole sauce in a frying pan (I used the same pan I sauteed the veggies in). 4. Place a corn tortilla in the mole sauce and let it get nice and soft. 5. Move the tortilla to the baking dish. Fill the tortilla with a smear of the pumpkin (about 1-2Tbsp should do it), a thin layer of black beans, and some of the sauteed veggies. Roll up the enchilada. 6. Repeat step 5 until you’ve made as many enchiladas as you fancy! Line them up in the baking dish, but don’t pack them too tight or it will be hard to remove them later! 7. Spread a little more mole sauce on top of the enchiladas. I keep it pretty thin because I like the enchiladas to be kind of crispy, but feel free to add more to your taste. 8. Crumble the feta cheese on top and bake for about 30 minutes, or until the edges of the enchilada are crispy and the insides are nice and hot. 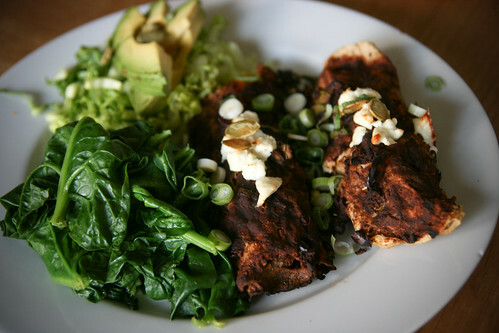 I love the idea of a mole sauce with sweet potato black bean enchiladas. I’ll try that next time, instead my usual salsa verde. Thanks for the link love. Your welcome, Karina. Thanks for the inspiration. Let me know how the mole sauce goes if you do try it. Monica! What a brilliant idea. It’s pumpkin season here, so I’ll be trying this out very soon. I like this whole-roasted pumpkin idea. I wonder if our neighbour’s enormous Queensland Blues could be managed like this – we’ve been cutting them into eighths just to roast/freeze in portions, but it was a hassle.